Will Internet TV Really Be Better for Consumers Than Cable? 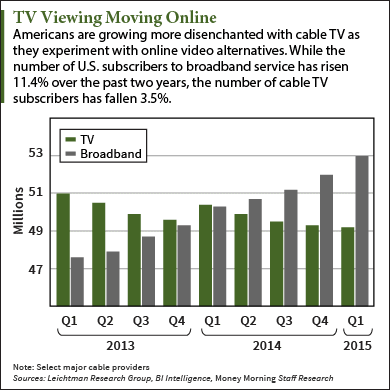 Subject: Will Internet TV Really Be Better for Consumers Than Cable? 5 − five = Required Please enter the correct value. After a lot of fits and starts, Internet TV is on the verge of breaking out from its niche status. And while online TV holds the promise of giving consumers more options than they've had in the past, it won't be a panacea. What's happening is that Americans who are fed up with their cable companies – the steep fees, lousy customer service, and restrictive "bundles" – have turned to Internet-based, video-streaming alternatives. There's Netflix Inc. (Nasdaq: NFLX), Sling TV, Hulu, PlayStation Vue, and Amazon.com (Nasdaq: AMZN), just to name some of the most prominent. Last month research firm MoffettNathanson reported that the total number of U.S. cable customers shrank by 0.5% from the previous year. That may not sound like much, but it shows the industry is at a tipping point. The portion of Americans that pay for cable was 80% in 2012, a figure expected to drop to 76.9% by next year. Companies in the cable industry and beyond know that Internet TV is the future – and no one wants to get left behind. The changes we're seeing now will touch just about every U.S. consumer of video content in some way. We've seen huge mergers like the Charter Communications Inc. (NYSE: CHTR) deal to buy Time Warner Cable Inc. (NYSE: TWC) for $78.7 billion and AT&T Inc.'s (NYSE: T) $48 billion acquisition of DirecTV (Nasdaq: DTV). Tech titan Google Inc. (Nasdaq: GOOG, GOOGL) has been rolling out its own high-speed fiber optic network, Google Fiber, in city after city. Apple Inc. (Nasdaq: AAPL) is prepping an Internet TV service of its own, which is expected to debut next year. Both HBO and Showtime started to offer their programming over the Internet outside of cable TV packages this year. Once Again, Apple T.V. is being pushed-out. Now its Fall or next year sometime. It sounds an awful like guesswork about when Janet Yellen might actually raise interest rates. The sticking point is the same with all conduits ( cable and internet): Content providers have the upper hand. They control and dictate the price. Apple will have to settle for a smaller assortment of viewer options or pay-up. So, it won't be quite the disruptor it might be whenever it does get released. This is largely why we don't already have all movies viewable as streaming content on Netflix, but only a small part of the film library. Many more titles are available on DVD. That is not going to change soon, if at all. Only when the content providers own the conduit will you see wider selections- and they won't be cheap for the good movies or classics.